I need a hand, I need some more eyes on the ground. I'm looking at these on FF44 and I just can't see anything to fix, apart from 2 small new bugs*. I already know about the New Tab page dropping its styling, that's caused by them changing from xul to xhtml there. I have a few ideas of how to get around that one. That might not seem a problem, but I want a few months off from these so I'd like to do any fixing stuff now. Could you (on alphas) have a look around for stuff that might need fixing on these, please? #1. urlbar dropmarker is using default dark dropmarker there - no problem, I'll code it to use my white one, as seen on the searchbar history and alltabs. #2. Buttons and menulists are jumbo again in Addons Manager. - slightly more tricky this one as I don't like forcing the sizes there, as they should be flexible for people that use large fonts. Anyway, bug is caused by the default code forcing the min-height up (why they think that is a good look is beyond me) - easy enough to fix. #3? Think maybe I might reduce the size of my bookmarks star. I have that much smaller in my SM stuff, so maybe it's because I haven't seen it on Firefox for a while, but it looks a bit large and crude to me. #1. Addon Manager category Icons fix. #2. Restyle of searchbar search dropdown. #3. Addon Manager buttons and menulists too large again in 44 fix. #4. Urlbar dropmarker in 44 fix. #5. Bottom Bar Close button fix. #6. Linux button focus twitch fix. #7. Text colour for disabled Addons fix. #8. Urlbar #identity-box in 44 fix. #9. XP Radio and Checkbox hovers adjustment fix. #1. Chat and Pocket buttons fix. #2. Improved styling in Options Window. #3. Improved styling on radio buttons. Amazingly, I've done another update on these! Small, but important fixes. Devs had been doing more 'max-widthing' on the toolbar buttons and these themes looked pretty wrecked. Only took a few lines and some unset commands to put things right again. After reading this yesterday - viewtopic.php?p=14393669#p14393669 ( Firefox's dead-or-really-really-dead policy, more like) I wasn't going to bother with these updates. Then it occurred to me that I had already done these fixes on one theme, so it was only a simple copy 'n paste job on the others. Plus, Mozilla has never hit a deadline yet, so Complete Themes will probably still be around in 2 years time or something. Status - Fully Reviewed (pretty good, all 4 themes fully reviewed less than 2 hours after uploading). I think this is more the appropriate sentiment... THE DOORBELL! In theory, I should do a minor update on these, but in practice being told by Mozilla that themes are being whacked at any moment, doesn't exactly inspire me to go the extra mile. Plus, it's surprising just how much time it takes, what with testing, betatesters testing, redoing files. It's odd, the actual 'fixes' take seconds to write. Anyway, I had a look at these and they seem fine, apart from a couple of bits. New Tab page coding has broken because they now code that page in xhtml - I can fix that with a devious route, if anyone is that bothered. If anyone notices anything breaking on these then you will let me know, won't you? Yeah, I know I'm supposed to do that, but I'm not using this browser these days, let alone checking up on these themes all the time. As most of you also know, Mozilla have announced plans to whack all Complete Themes, but will not say when. As you can imagine, just as they intended, this also doesn't exactly inspire my devout attention to this stuff. 'Having said that', until they pull the plug, standards will not drop. Just let me know what, if anything, needs fixing and I'll fix it. - told you this new method worked well, didn't I? Notice just how little ever breaks anyway with me doing damn all? Frank Lion wrote: If anyone notices anything breaking on these then you will let me know, won't you? Well if you insist..via the appropriate communication channel..
Of course, I'll let you know. I'm using your themes across the board, on Firefox, Thunderbird, and SeaMonkey. When I'm not campaigning for Trump, I'm looking for flaws in your beautiful work. jimfitter wrote: Of course, I'll let you know. I'm using your themes across the board, on Firefox, Thunderbird, and SeaMonkey. When I'm not campaigning for Trump, I'm looking for flaws in your beautiful work. You see that dog handler in the documentary film, Django? The one standing at the base of the large round tree? You are aware of him?.......That's you, that is. That's you at your most eloquent. That's you trying your hardest to be understood, that is. .....That's you, at your best! I was just checking these using Firefox 50 and, amazingly, they still seem to be working fine. *** Don't read below this line, it's really dull. Technical stuff - the above does most tooltips, but not all. To do all, you have to override popup.css and thus constantly keep an eye on Default, in case there are changes to popup coding, etc. Because I don't want to do that, er, then I haven't done that here. Even more technical stuff - Theme jars are not 'allowed' by Mozilla to use override in the chrome.manifest. If you need to do this - as I did with the scrollbars - then you do a Type 32 multipackage install and code up a small .xpi to use the override command. I'm mentioning this because if you want/need to use override for popup.css then you'd put the code (in my case) into the scrollbars.xpi as well. This is what I did for some of my SM stuff, where I wanted all tooltips styled. Always did find these themes intriguing, glad to know they still work. 3. The bookmark button (star + dropmarker-button) aren't styled in the Metal Lion style. 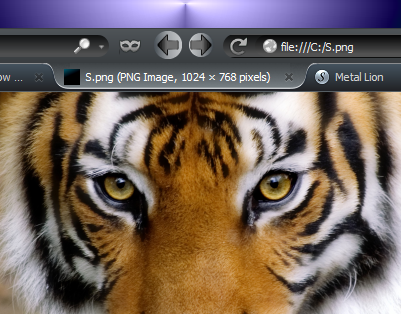 Frank Lion wrote: Theme jars are not 'allowed' by Mozilla to use override in the chrome.manifest. Not true - this was added in bug #1170207 for Firefox 41. Last edited by Daifne on July 25th, 2016, 7:10 am, edited 1 time in total. bug #1170207 for Firefox 41. Usual too little, too late and no one cares. I needed that back in FF29 for content scrolls, not now. Worked around it.